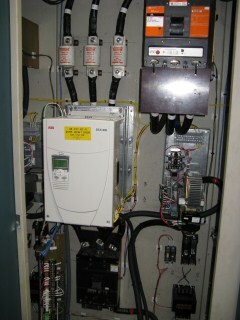 Premier Drive Systems, llc has been successful on upgrades and new installations. Graphic Packaging, West Monroe, La. Winder #5 Rebuild. The Winder 5 at this facility was running on 1950 vintage GE M-G set controls. Premier Drive Systems had made several successful onsite visits to repair this winder system. Finally the system suffered a major failure. Due to the availability of parts, a repair was not possible. However, we were able to configure the system so that it could operate at reduced capacity with a temporary repair. The Mill solicited suggestions from Premier Drive Systems and Rockwell Automation. They accepted Premier Drive Systems suggestions of a 2 step approach. Step 1 was to build up a functional system using parts of an existing Reliance Electric Automax System they had in stock as a precautionary measure in case the temporary repair failed. Step 2 was to design and install a complete winder drive control system as soon as when we could get parts. Upon checking we found that the ABB DCS800 Drives had a lead time of several weeks and Rockwell Automation had their PowerFlex DC drives on the shelf. We proposed solutions with these options to mill management and they choose to wait for the ABB DCS800 drive with the Automax system in place as a backup plan. 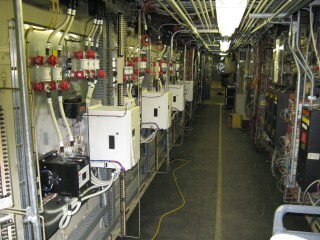 In Jan 2010, Premier Drive Systems and mill personnel installed the hardware and commissioned the drives during a two day outage. Due to the problems they had been having, they wanted to keep this outage a short as possible. 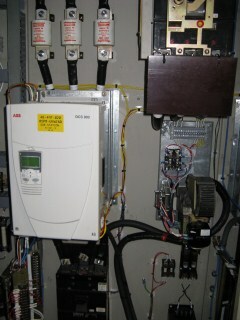 Once the hardware was installed and verified, Premier Drive Systems commissioned the ABB DCS800 drives and had a running winder in approximately 6 hours. 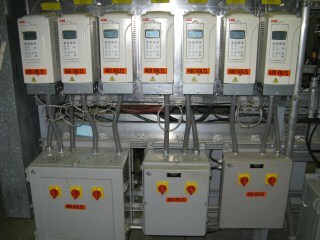 The winder has since run with little or no problems with the ABB Drives or control scheme. The winder production and uptime has increased tremendously. The Mill is pleased with the operation and functionality of the new drives and controls supplied. 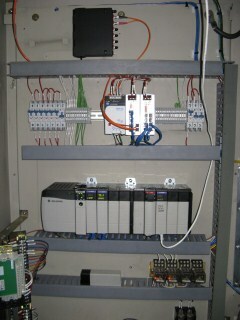 Here are a few pictures of the installation into an existing cabinet. An existing Analog DC Drive with Multiple Paper Rolls Motors. Due to the increased cost of DC motor maintenance and replacement, this customer requested options. It was found that the AC Drives and Motor were a sure bet for reduction of ownership cost. 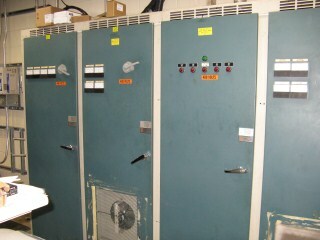 Working with them, we replaced this Parallel Armature DC drive for Paper-Rolls to AC drives. DC Drives from Reliance Analog to New Digital Drives. Premier Drive Systems, llc, utilizing the Rockwell Automation Controllers, were able to build a system that can have all working together. This would allow a sectional approach to transitioning the entire machine to Digital drives. Premier Drive Systems, llc hopes that we can work with you on your next project. We believe that the customer should have say in the front end design, thus making the system more simpler to troubleshoot and repair should the need arise. Rockwell Automation, ABB, Baldor, AMCI are owned and copyright to their respective companies.